Rear shank: Montana Fly Company 80-millimeter Big Game Shank. Tail: Foam tip glued to a leather strip. Body: EP brush. Rear legs: 550 paracord. Hook: Ahrex PR350 Light Predator S/E, size 6/0. Midshank: Montana Fly Company 80-millimeter Big Game Shank. Body: EP brush. Front legs: 550 paracord. Head: Flymen Fishing Company Double Barrel Popper on a 40-millimeter shank, EP Brush, and foam ears. Eyes: Flymen Fishing Company Dragon Eyes. These types of innovations draw many rodent-fishing aficionados to Yewchuck’s work. He’s constantly trying new things to improve his rodent patterns. Another example of Yewchuck’s creativity is his original approach to stinger tails. Yewchuck’s rodent patterns are so impressive, it’s easy to overlook how skilled he is in other areas. I was blown away by his unique take on a crayfish. There are thousands of crayfish patterns, but Yewchuck’s KingKray toes the line between form and function with a creative intensity not seen elsewhere. And Yewchuck not only ties a bat imitation, but designed a complete foam wing structure using Kiley’s Exo Skin as wing webbing. Yewchuck is a mad scientist with an eye for detail, and a tier who can be as selective as the fish he is trying to catch. In the last three years, he’s become interested in muskies and other apex predators, and his flies have grown in proportion. Yewchuck’s skills haven’t gone unnoticed. He guides in the Great Lakes and Catskill regions, using his flies to put clients onto migratory brown trout and steelhead in New York, Pennsylvania, Ohio, and Canada. He has designed several patterns for the likes of Flymen Fishing Company and the Montana Fly Company. Recently, he was featured in Tony Lolli’s book, The Art of the Fishing Fly. Yewchuck has been tying for 28 years, but it’s clear he’s only getting started. Head: Flymen Fishing Company Double Barrel Popper, airbrushed for color, with 8.8-millimeter Flymen Fishing Company Living Eyes. Hook: Gamakatsu Round Bend, size 2/0. Body: Spun deer hair and Hairline Chocklett’s Body Wrap. Arms: Ostrich herls and dry fly hackle. Tentacles: Hairline Micro Pulsator Strips. Mantle: Montana Fly Company 55-millimeter shank, EP Tarantula Brush, and Hairline Chocklett’s Body Tubing. Fins: Preshaped Kiley’s Exo Skin. Tail: EP Fibers over paracord filled with two size 3 shots. Melt and close the end of the paracord. 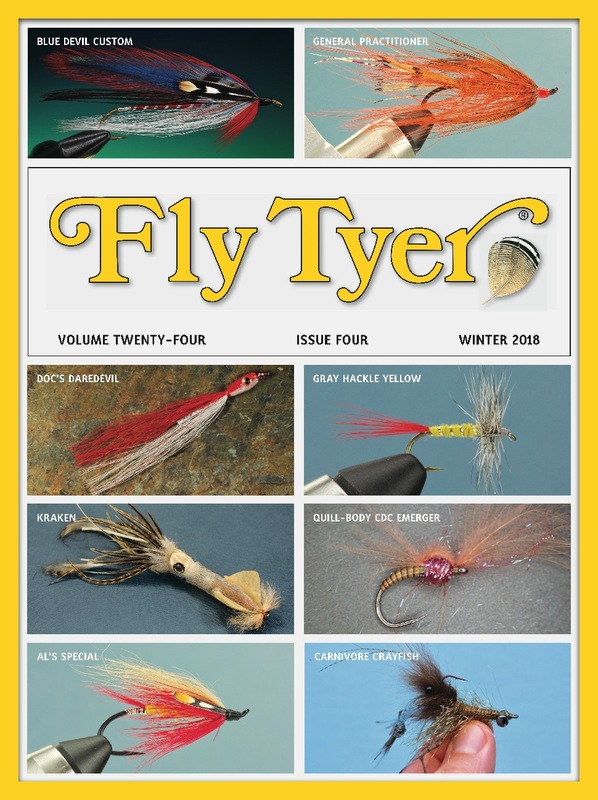 Regardless of what he’s tying, the unifying theme at the heart of Yewchuck’s flies is the intersection of form and function. They look fantastic, have realistic action, and are durable enough to withstand the rigors of big predatory fish. There are tiers who design imitations using standard ingredients, and then there are tiers—like Yewchuck—who create unique and innovative flies using new materials in unconventional ways. These pattern designers keep pushing the boundaries of what’s possible. Ryan Sparks writes, fishes, hunts, cooks, and talks nonsense to his English pointer, Tippet. You can follow his writing and photography at www.flywatermedley.com. To see more of Steve Yewchuck’s incredible flies, go to his Instagram page: @envisionflyworks.